For other uses, see Goodwater. Goodwater is a village within the Rural Municipality of Lomond No. 37, in the province of Saskatchewan, Canada. 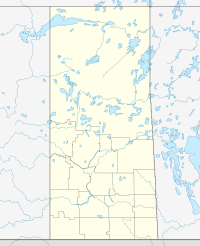 The village is located approximately 50 km (31 mi) south of the city of Weyburn. ^ a b "Corrections and updates: Population and dwelling count amendments, 2011 Census". Statistics Canada. February 14, 2013. Retrieved February 16, 2013. ^ "2011 Community Profiles". 2011 Canadian Census. Statistics Canada. July 5, 2013. Retrieved 2013-02-16. This page was last edited on 12 August 2018, at 15:48 (UTC).